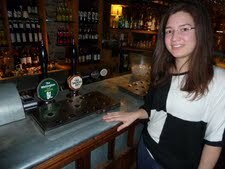 Hobbs & Porter produce zinc worktops and zinc restaurant bar areas. 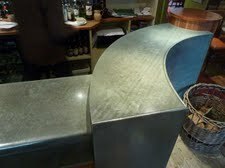 All our zinc items are bespoke. 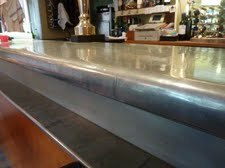 Zinc split level bar showing integral customers drink shelf, 65mm thick front nosing and brazed joint. Zinc sheets generally come in 2400mm lengths hence the join. 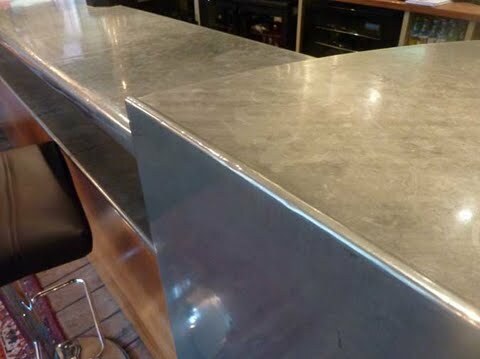 65mm thick zinc bar worktop, other thicknesses are available on request. Most kitchen worktops quotation requests are for 40mm, 50mm and 60mm thickness. Curved zinc work works out more expensive than straight or square work but its individuality means it is well worth the extra cost. 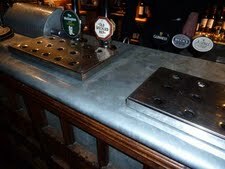 Durable zinc bar top in busy pub. Zinc develops a lovely patina with age. 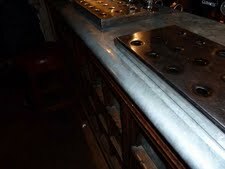 Bespoke zinc pub bar top showing patina and rolled front edge. 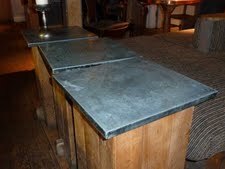 Zinc tables available as a one-off or in bulk quantities. Any size available. 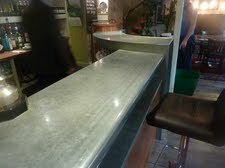 Larger image of 65mm thick zinc worktop.